I feel sorry for folding chairs. Scratched, dented, and spray-painted with the universal phrase “Property of ____,” they are the outcasts of the chair world. More of a machine for sitting than fine furniture, the ubiquitous institutional steel folding chair does its job spectacularly poorly. After all, who doesn’t have memories of sitting uncomfortably in such chairs at Boy Scout meetings, church socials, or high school graduations? Thus, I resolved to free the chairs from that way of life. I designed a mechanical “prosthesis” that, when attached to a folding chair, would allow it to open and close on its own. 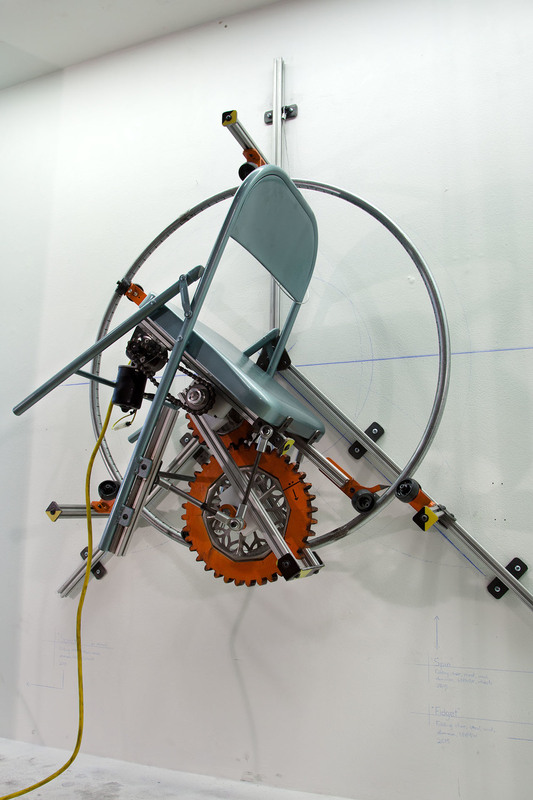 By attaching ratcheting wheels or pawls to the feet of the chair, the opening/closing movement would become forward locomotion, allowing the chairs to “walk”. The chairs would be taking their first steps to freedom. Unfortunately, the resulting machines were more pitiful than before I began working on them. Tethered by extension cords to electrical outlets, they were forced to pace in circles, like a dog on a leash or a hamster on a wheel. Others shuffled around aimlessly in the corner, having been given locomotion but nowhere to go.